And just when we thought it couldn't get better. Stephanie shows up with Valentine Garland! AND she used Giddy. I wonder how many of the Be Mine projects I could make with my layer cake? Well I won't be able to know, because I sort of made another project with it that I am not at liberty to show at this time. Shoot I am nearly out of Giddy. woohoo that my project is a secret at the moment (usually means good things coming to a designer). Okay so be sure to stop back tomorrow for Natalia's project. I haven't see it...but it's Natalia...it HAS to be good right? 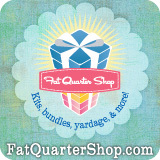 Oh and let's not forget our sponsor the Fat Quarter Shop. They have offered up a $50 gift certificate from each of the 7 blogs. Plus the grand prize of $100 gift certificate and must comment on ALL 7 blogs to be entered for that. So folks today is one of my days off. 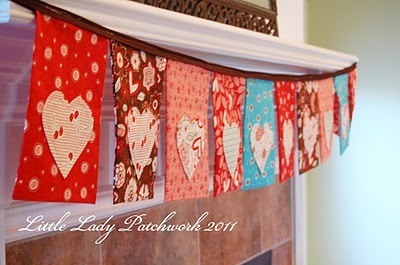 I am crossing my fingers that I will get to sew some. okay mostly stuff for my sister's baby shower in 2 weeks. I hope to finish the applique onesies, start on a wipes bag, make burp clothes, pacifier holder and on and on and on....wish me luck. Goodluck with your sewing day! And thanks for hosting such a great blog tour! It's been lots of fun! Have a nice sewing day :) Enjoy yourself! Ooohhh...I want to see your secret! THANKS FOR YOUR NEAT+SWEET IDEAS! All the projects have been really cute. Thank you for putting this together. Good luck!!! I haope that you are able to use this day to get some stuff done. Stephanie's garland is so cute! Your sister (or should I say her baby) is going to be really happy with all the goodies that you are making for them. i love the banner. it is so cute. back again, just wanted to visit. I love your garland! How cute would that look hanging on a fireplace. Thanks for all the wonderful ideas. Thanks, Vickie. It's been fun.